Story added on 16 January 2006. Added on 30 June 2005. "...since I was only a sergeant and she would be a 2nd lieutenant &emdash; I would have to salute her! I planned to give her a kiss too. Have you ever seen a sergeant kiss a 2nd lieutenant?..." Added on 29 March 2005. "...As I rounded a corner all hell broke loose. I had gotten myself in the middle of a fire fight between our riflemen and the enemy. Tracers were going both ways as well as shell dropping in the street. I ran for the nearest building. As I crossed the threshold there was a rifleman kneeling in the doorway..."
"...We were perfect targets in the bright sun. The Jerries could see us but we couldn't see them until too late. Hilfarth looked deserted as we approached. Tomlin was 10 yards from a MG 42 when they opened up. The machine gun got Mirman and Tomlin right away. Everyone dived for the side of the road..."
"My P. O. W. Experiences"
"He Shouda Stood in Bed!" "Unusual Men of Co. I., 406th"
"...Cpt. Hungate inquired as to how accurately the man was firing. The report was that it looked like he would be an Expert. Captain Hungate told them to let him qualify lefthanded..."
"...There was one incident when I was alone in my foxhole. It was early morning and very foggy. (That's why our planes couldn't fly.) I heard this rumble in front of my position. It was getting louder and louder when suddenly directly if front of me was this huge Mark IV tank heading straight for my position. I couldn't get out of the way; that would expose me. I certainly was not going to surrender so I did the only thing I could possibly do. I settled down to the bottom of my foxhole and prayed that it didn't collapse when the tank overran my home away from home. As luck would have it (they don't call me 'Lucky' for nothing) my hole in the ground remained in tact. The tank went about 25 yards past my hole and turned and went back to wherever it came from. Unfortunately, I had no firepower that could have stopped it..."
"...We were in foxholes. The enemy is in front of us and always curious as to what we are doing. We are the same way and as a result we send out patrols to spy on each other or to take a prisoner or two. The night is dark and black as a witch's robe. Suddenly in front of you -- somewhere -- you hear some movement. Your first conclusion is that it is a German patrol. We want to see what is going on so we send up a flare to light up the neighborhood. You scan the area in front of you and see the source of the noise. C O W S! There they are sniffing around for some vegetation. You advise the line of the problem and set up a plan. You fire a series of flares and sadly shoot the cows -- or pigs. We could not take a chance and assume that the noise was from the animals all the time. It could just as easily be a German patrol..."
"...The company became of age (combat wise) during the ensuing night. Our perimeter defense was nearly complete when we were hit with the anticipated counter attack. A 35-40 man German patrol, armed with automatic weapons (MG & Burp guns) partially overran our positions. When dawn eventually broke, we counted 12-13 of their dead within the company area with a minimal loss to ourselves. The result was a tremendous uplift of unit morale..."
"...The "Interpreter" joke kept me off pulling any guard duty, bless be. It did have amusing sidelights. As a guy who's followed Jazz closely but never learned a note of music, I once tried to teach six Krauts in a German Oomp-Pah band how to play Glen Miller's stock arrangements for dancing at the beer hail we set up for ourselves..."
"...Walker told Godwin "Go, but not in this hole." Godwin left and soon we heard a scream, a splash and a cry for help &emdash; "I'm drowning!" By searching the ground on our hands a knees with a map flashlight, we found Godwin treading water in the largest septic tank I have ever seen. We pulled him out and told him to get lost; if the Germans didn't do us in the smell would. Godwin refers to this as his 'unfortunate incident in Germany..."
"...While we were sitting on the edge of our foxholes enjoying some "real" food, we noticed three P-47s circling around overhead. However, we did not pay much attention to them until suddenly they started peeling off and came in on us in a strafing run. We found out later that these planes had been captured by the Germans..."
"...A dying GI lay in the tool room; his face was a leathery yellow. A wounded GI lay with him. Another wounded dough lay on his belly in the cow shed, in the stench of dung and decaying beets. A couple of doughs started frying eggs in the kitchen. I went into the tool shed to the dying dough. "He's cold. He's dead." said Sgt. Charles Turpin, the MG squad leader. I took off my glove and felt his head but my hands were so cold he felt warm. The medic came and said he was dead..."
"...Windy Corner lay ahead. We approached cautiously, dreading the horrible possibility of being caught in its bowels just as another barrage was set off by the enemy. No loitering here. A moment of hesitation, then a dash across the abyss to the refuge of a dark and obscured field..."
"...Whitie gave the order to our platoon runner to pass the word that we were pulling out. The situation dictated that we crawl as close to the ground as humanly possible. Our runner was Eddie Holzknecht, a fine young man from Louisville, KY. Eddie approached me to give me the message from Whitie. He raised his head above the small of my back to see in the complete darkness if anyone was out there who had not received the order to withdraw. He was immediately hit in the head by machine gun fire..."
"...I fell into the fox hole near me and dragged the phones in with me. One of the men, Flemming [Donald W.], fell in on top of me. We lay there for a few minutes and then Flemming said "OH" very loud. I figured he'd been hit. The barrage let up so we got out of the foxhole and we inspected him. He started pulling off his field jacket, sweater, wool shirt, long johns and a t-shirt. A piece of schrapnel had penetrated everything but the t-shirt. 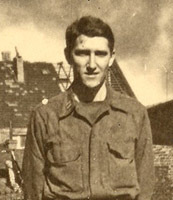 All those clothes saved him from a Purple Heart with only a bruise..."
"From the Diary of Elwin Miller"
by Elwin Miller, 406th, Co. K.
"...We fired hand grenades, anti-tank grenades and over a hundred rounds of 30 caliber ammo. Our line beat off the attack and then artillery and mortars opened up. An enemy machine gun clipped me alongside of the head during the attack. It bled a lot so I bandaged it and took sulfa pills. It didn't hurt much but scared me at first..."
Added on 28 July 2003. "...Sgt. Gunn explained that apparently White had a faulty grenade on his belt. Somehow the firing pin came loose and he and Mac Gunn were unable to tear the grenade loose. White realized that the whole squad was in danger so he shoved Mac out of the way, ran out, and threw himself on top of the grenade. What a sacrifice..."
"...I yelled back to Thomas (Harold W.) for the column to get moving. I saw a hole appear in his helmet. His head drooped, shot through the brain. I knew now a sniper had a good field of fire. I was laying on my stomach. I quickly put my weight on my left elbow and looked back as he pulled the trigger. Instead of getting me in the brain the bullet went through my left eye and the bridge of my nose. The bone and tissue flew into my right eye. I was blinded. I knew my left eye was gone but I didn't know about the other one..."